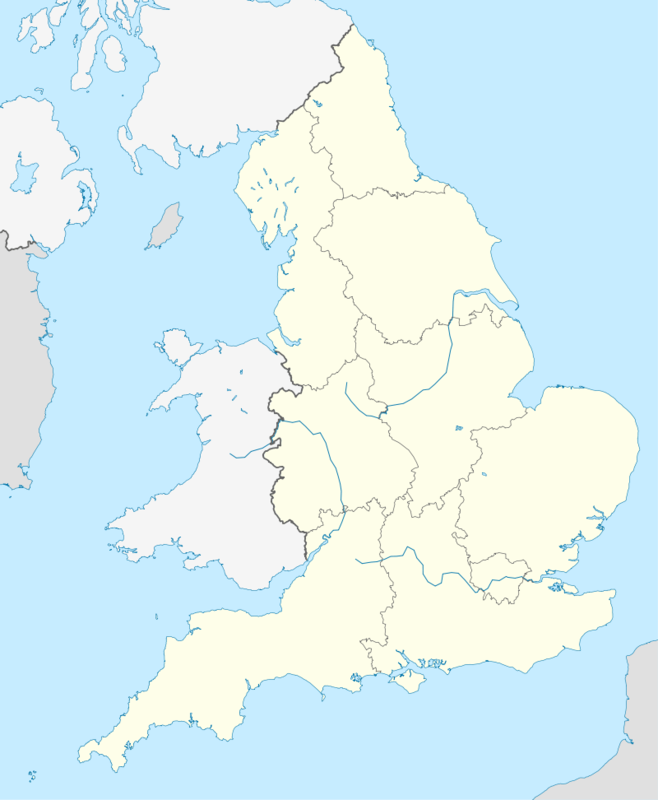 The 2012–13 Football League Two (referred to as the Npower Football League Two for sponsorship reasons) was the ninth season of the league under its current title and twentieth season under its current league division format. It started on 18 August 2012 and finished on 27 April 2013 with all matches that day kicking off simultaneously. Note: Table shows mathematically qualified teams as of 28 April 2012 in alphabetical order. Twenty-four teams contest the division: 18 sides remaining in the division from last season, four relegated from League One, and two promoted from Conference National. 1 2 "English League Two Stats: Top Goal Scorers – 2012–13". ESPN. Retrieved 22 August 2012. 1 2 3 4 5 "English League Two Stats – 2012–13". ESPN. Retrieved 22 August 2012. ↑ "Football League Two". Football365. Retrieved 14 April 2012. ↑ "Burton Albion sack manager Paul Peschisolido". BBC Sport. 17 March 2012. Retrieved 27 May 2012. ↑ "Burton Albion name Gary Rowett as permanent manager". BBC Sport. 10 May 2012. Retrieved 27 May 2012. ↑ "Andy Hessenthaler steps down as Gillingham manager". BBC Sport. 8 May 2012. Retrieved 27 May 2012. ↑ "Ex-Barnet boss Allen takes charge of League Two rivals Gillingham". Daily Mail. 5 July 2012. Retrieved 8 July 2012. ↑ "Barnet appoint Mark Robson as new head coach". BBC Sport. 11 June 2012. Retrieved 17 June 2012. ↑ "Edgar Davids joins Barnet: Dutchman ready for challenge". BBC Sport. 12 October 2012. Retrieved 24 October 2012. ↑ "Chesterfield manager John Sheridan sacked". BBC Sport. 28 August 2012. 1 2 "Chesterfield appoint Accrington boss Paul Cook". BBC Sport. 25 October 2012. Retrieved 26 October 2012. ↑ "AFC Wimbledon sack manager Terry Brown". BBC Sport. Retrieved 19 September 2012. ↑ "AFC Wimbledon appoint Neal Ardley as new manager". BBC Sport. Retrieved 12 October 2012. ↑ "Gary Waddock sacked as Wycombe Wanderers manager". BBC Sport. 22 September 2012. ↑ "Gareth Ainsworth gets Wycombe Wanderers job for season". BBC Sport. 8 November 2012. ↑ "Richardson Appointed Manager". Accrington Stanley FC Official Site. 1 November 2012. ↑ "Fleetwood Town appoint Graham Alexander as boss". BBC Sport. Retrieved 1 April 2013. ↑ "Mark McGhee: Struggling Bristol Rovers sack manager". BBC Sport. British Broadcasting Corporation. 15 December 2012. Retrieved 16 December 2012. ↑ "Carl Fletcher sacked by League Two strugglers". BBC Sport. British Broadcasting Corporation. 1 January 2013. Retrieved 2 January 2013. ↑ "Plymouth Argyle appoint John Sheridan as new manager". BBC Sport. Retrieved 1 April 2013. ↑ "Rochdale sack manager John Coleman". BBC Sport. British Broadcasting Corporation. 21 January 2013. Retrieved 21 January 2013. ↑ "Keith Hill: Rochdale return for former Barnsley manager". BBC Sport. British Broadcasting Corporation. 22 January 2013. Retrieved 22 January 2013. ↑ "Aldershot Town sack Dean Holdsworth as manager". BBC Sport. British Broadcasting Corporation. 20 February 2013. Retrieved 20 February 2013. ↑ "Aldershot appoint Scott as boss". BBC Sport. British Broadcasting Corporation. 22 February 2013. Retrieved 22 February 2013. ↑ "Daggers' Still is new Luton boss". BBC Sport. British Broadcasting Corporation. 26 February 2013. Retrieved 26 February 2013. ↑ "Gary Mills: York City sack manager after loss to Bradford". BBC Sport. British Broadcasting Corporation. 2 March 2013. Retrieved 3 March 2013. ↑ "York appoint Worthington as boss". BBC Sport. British Broadcasting Corporation. 4 March 2013. Retrieved 4 March 2013. ↑ "Sturrock sacked as Southend boss". BBC Sport. British Broadcasting Corporation. 25 March 2013. Retrieved 25 March 2013. ↑ "Phil Brown named new Southend United manager". BBC Sport. Retrieved 1 April 2013. ↑ "English League Two Stats: Assists Leaders – 2012–13". ESPN Soccernet. Entertainment and Sports Programming Network (ESPN). Retrieved 26 August 2012. ↑ "Port Vale 6–2 Rotherham". BBC Sport. 8 September 2012. Retrieved 22 September 2012. ↑ "Port Vale 4–0 Bristol Rovers". BBC Sport. 20 November 2012. Retrieved 6 July 2013. ↑ "Port Vale 3–2 Cheltenham". BBC Sport. 29 March 2013. Retrieved 6 July 2013. ↑ "Morecambe 0–4 Fleetwood". BBC Sport. 8 September 2012. Retrieved 22 September 2012. ↑ "Oxford United 5–0 Accrington Stanley". BBC Sport. 20 October 2012. Retrieved 20 October 2012. ↑ "Barnet 3–2 Burton Albion". BBC Sport. 21 December 2012. Retrieved 24 January 2013. ↑ "Morecambe 3–1 AFC Wimbledon". BBC Sport. 24 November 2012. Retrieved 24 January 2013. ↑ "Sam Morsy targets goals to secure first team place". The Sentinel. 28 August 2012. Retrieved 28 August 2012. ↑ "York 2–2 Chesterfield". Retrieved 15 September 2012. ↑ "Cheltenham 1–1 Bristol Rovers". Retrieved 20 February 2012. 1 2 "English League Two Stats: Team Discipline – 2012–13". ESPN. Retrieved 23 August 2012. 1 2 "English League Two Stats: Player Discipline – 2012–13". ESPN. Retrieved 23 August 2012. ↑ "Allen named Manager of the Month". football-league.co.uk. The Football League. 14 September 2012. Retrieved 14 September 2012. ↑ "Wright named Player of the Month". football-league.co.uk. The Football League. 14 September 2012. Retrieved 14 September 2012. ↑ "Adams named Manager of the Month". football-league.co.uk. The Football League. 12 October 2012. Retrieved 12 October 2012. ↑ "Pope named Player of the Month". football-league.co.uk. The Football League. 12 October 2012. Retrieved 12 October 2012. ↑ "Yates named Manager of the Month". football-league.co.uk. The Football League. 16 November 2012. Retrieved 16 November 2012. ↑ "Vincent named Player of the Month". football-league.co.uk. The Football League. 16 November 2012. Retrieved 16 November 2012. ↑ "Sturrock named Manager of the Month". football-league.co.uk. The Football League. 14 December 2012. Retrieved 14 December 2012. ↑ "Akinfenwa named Player of the Month". football-league.co.uk. The Football League. 14 December 2012. Retrieved 14 December 2012. ↑ "Rowett named Manager of the Month". football-league.co.uk. The Football League. 11 January 2013. Retrieved 11 January 2013. ↑ "Grimes named Player of the Month". football-league.co.uk. The Football League. 11 January 2013. Retrieved 11 January 2013. ↑ "Allen named Manager of the Month". football-league.co.uk. The Football League. 15 February 2013. Retrieved 16 February 2013. ↑ "Parkes named Player of the Month". football-league.co.uk. The Football League. 15 February 2013. Retrieved 16 February 2013. ↑ "Sheridan named Manager of the Month". football-league.co.uk. The Football League. 12 April 2013. Retrieved 14 April 2013. ↑ "Banton named Player of the Month". football-league.co.uk. The Football League. 12 April 2013. Retrieved 14 April 2013. ↑ "Smith named Player of the Month". football-league.co.uk. The Football League. 17 May 2013. Retrieved 17 May 2013. ↑ "Worthington named Manager of the Month". football-league.co.uk. The Football League. 17 May 2013. Retrieved 17 May 2013.